"Presentation of the Adversary ." "Adversary's Challenge to YHVH's Question [7-11]." "Inflictions on Job's Possessions [13-19]." "Job's Patience, and Remaining True to God [20-22]." "Satan's Second Meeting Before the Lord [1-5]." "The Limitations Placed on Satan (Job's Boils) [6-10]." "Job's Three Friends Arrive [11-13]." "Job Lamented his Birth [1-10]." "Job Lamented his Infancy [11-19]." "Job Lamented his Manhood [20-26]." "Eliphaz's First Address to Job [4:1 to 5:27]." "Eliphaz's Advice to Job, Continued from Chapter 4." "Job's Reply to Eliphaz's First Address." "Job Continues His Reply to Eliphaz's First Address." "Bildad's First Address to Job." "Job's Answer to Bildad's Address." "Zophar's First Address, Rebuke, Human Ignorance." "Job's Address to Zophar Continues." "Job's Reply to Zophar's First Address Continued." "Eliphaz's Second Address, on Job's Reasoning [1-16]." "Eliphaz's Understanding of God's Dealings [17-35]. "Job's Reply to Eliphaz's Second Address." "Job's Reply to Eliphaz Continued." "Job's answer to Bildad's Second Address." "Zophar's Second Address to Job." 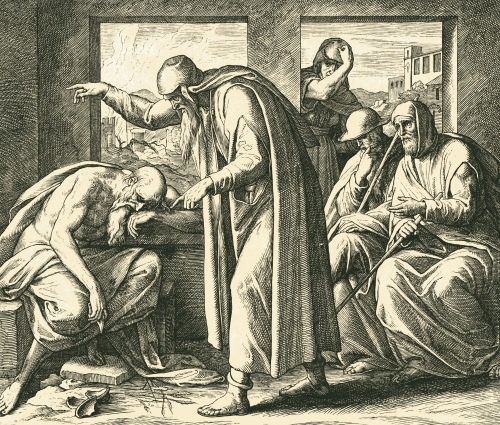 "Job's Reply to Zophar's Second Address." "Job's Answer to Eliphaz's Third Address"
"Job Speaks on Man's Iniquity"
"Job's Reply to Bildad's Third Address." "Job Continues Speaking to Bildad's Address [1-6]." "Zophar's third address to Job [7-23]." "The Continuation of Zophar's Last Address." "Job's Sorrowful Description of his Present Misery." "Solemn Claim of his Innocence." "Elihu's Words to Job, Speaking of God's Goodness." "Elihu's Words to Job's Friends." "Elihu's Words to Job Continued." "Elihu's Words on God's Behalf." "The Animate Creation. Wisdom Manifested in the Inward Parts." "God's Second Address to Job Continued." "Yahoveh Finishes with Job [1-6]." "Yahoveh Speaks to Job's Three Friends [7-11]."